This women’s tennis skort keeps you comfortable when you’re staying ahead in the rallies. Made with sweat-wicking climalite� fabric, it features built-in tights, soft fabric and a slim fit. 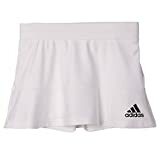 This entry was posted in Tennis and tagged Adidas, divided, Premium, Skirt, Skort, Tennis, Women'S by FPSports. Bookmark the permalink.